A. What are the factors that determine the damage done by a major earthquake? Is there a correlation between the magnitude of an earthquake and the number of people who die? ​You are going to investigate this question and produce a report on your findings and the reasons for them. 1) Is there a link between the magnitude of an earthquake and the number of deaths? 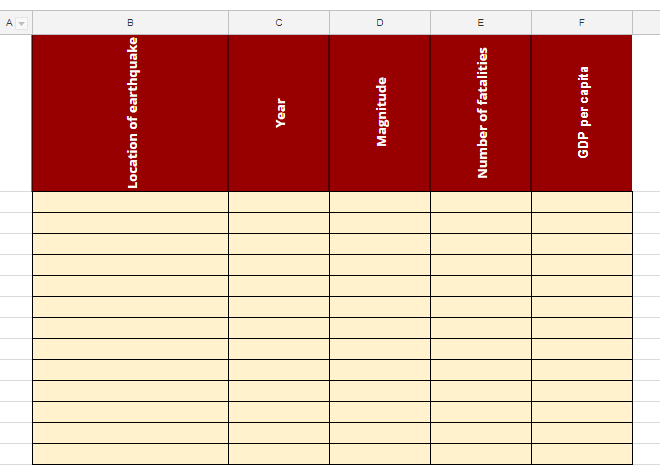 Use the BBC article below to create a spreadsheet that you can use to investigate the correlation between earthquake magnitude and the number of fatalities. you can make a copy of the spreadsheet below and edit it for your investigation. Use your spreadsheet to create a scattergraph and line of best fit of number of deaths against magnitude. Make sure the graph is complete with title, labelled axes and a key if needed. Think carefully about the minimum and maximum values on your axes. Is there a correlation between magnitude and deaths? How strong is it? What are the anomalies? Identify them and try to explain. What other factors might be important? 2. Is there a link between how rich and country is and how people are affected by earthquakes? Use the World Bank website to add GDP per capita data to your spreadsheet (make sure you know what GDP per capita is and how it is calculated!). Draw a second scattergraph - Number of deaths against GDP per capita. Copy and paste this into the same document and analyse it as above. 3. What are the factors that affect how many people die in an earthquake? Investigate each of the aspects below and explain, using examples, how they can affect the number of people who die in a natural disaster. Can you build an earthquake proof building? How deep the earthquake is below the ground will have an effect on the strength of the shaking and on aftershocks. Why is the depth of an earthquake important? Check that you understand what is meant by population density. Explain how the density of population will have an effect on how many people will be affected. Time of day at which the earthquake occurs. Why might and earthquake do more damage at 8.30am than at 11pm? Look for examples to help explain. History of earthquakes in the area and the experience of local people (you could compare Haiti and Japan as an example here). Why might earthquakes kills fewer people in a place where they happen more often?